SHANGHAI - China's Tiangong-1 space station re-entered the earth's atmosphere and burnt up over the middle of the South Pacific on Monday, the Chinese space authority said. The craft re-entered the atmosphere around 8:15 a.m. Beijing time (0015GMT) and the "vast majority" of it had burnt up upon re-entry, the authority said in a brief statement on its website. 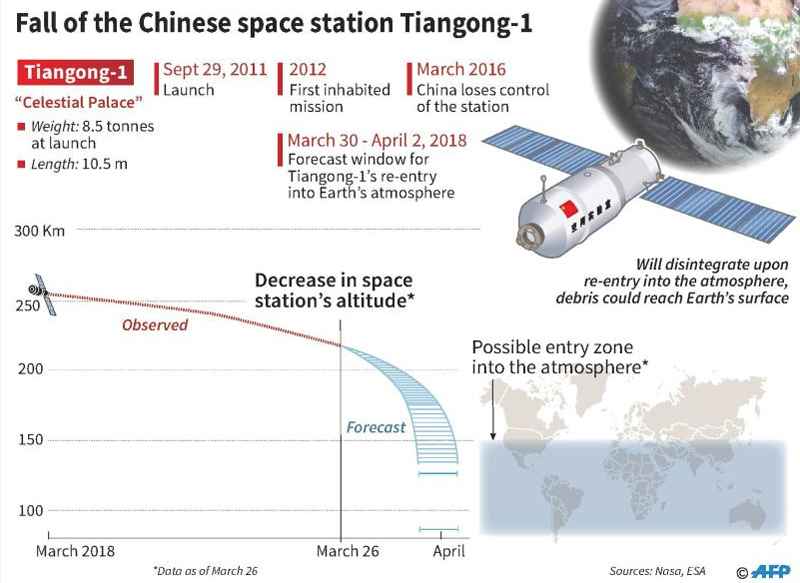 The 10.4-metre-long (34.1-foot) Tiangong-1, or "Heavenly Palace 1", was launched in 2011 to carry out docking and orbit experiments as part of China's ambitious space programme, which aims to place a permanent station in orbit by 2023. China had said its re-entry would occur in late 2017 but that process was delayed, leading some experts to suggest the space laboratory was out of control. "It's normal for spacecraft to re-enter the atmosphere, yet Tiangong-1 received so much attention partly because some Western countries are trying to hype and sling mud at China's fast-growing aerospace industry," it said.